We're always stoked to post family snap shots that turn up little gems of information. Here's one of those photos, taken back in the summer of 1967 at Old Man's, San Onofre. 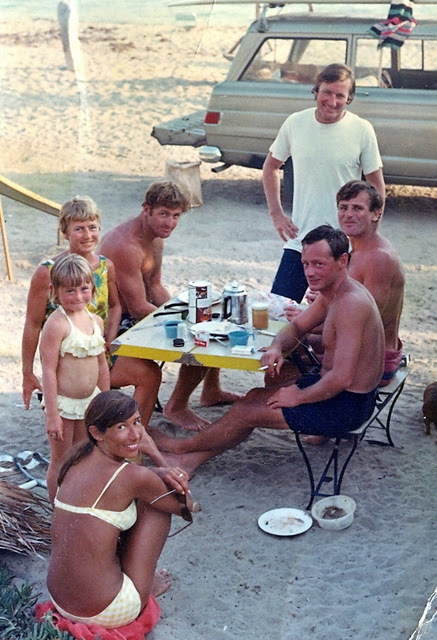 Pictured clockwise (closest) Betty VanDyke, Karen Gallagher (Surf Guide fame), Gretchen (mom), Peter VanDyke (sitting), Gene VanDyke (standing), (sitting) Fred VanDyke, and Charles Gallagher. Photo: Gallagher Family Archives. 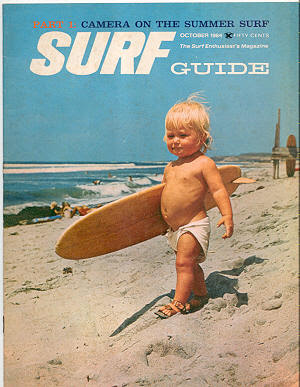 Below is the cover of the Surf Guide magazine (V2#9, Oct. 64) that featured a younger Karen Gallagher.